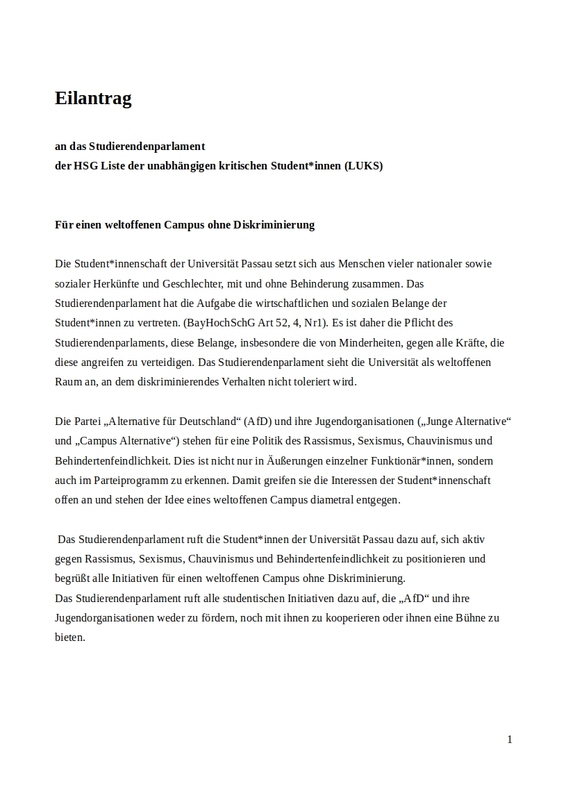 In den letzten Wochen haben wir unter dem Motto #BachelorOfChairs viele Aktionen für eine bessere Uni umgesetzt. 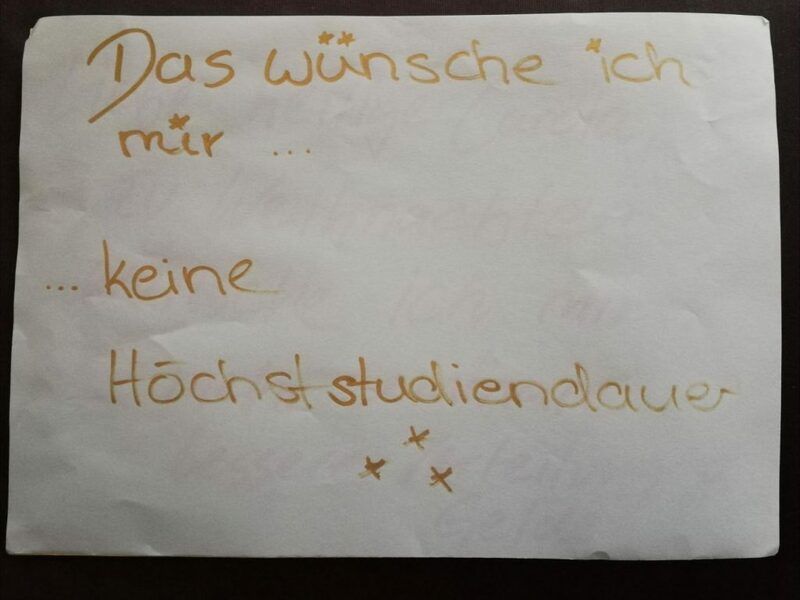 Wir haben mit über 2000 Student*innen gesprochen und das Feedback erhalten, dass viele von euch ähnliche Probleme mit der Uni haben wie wir. 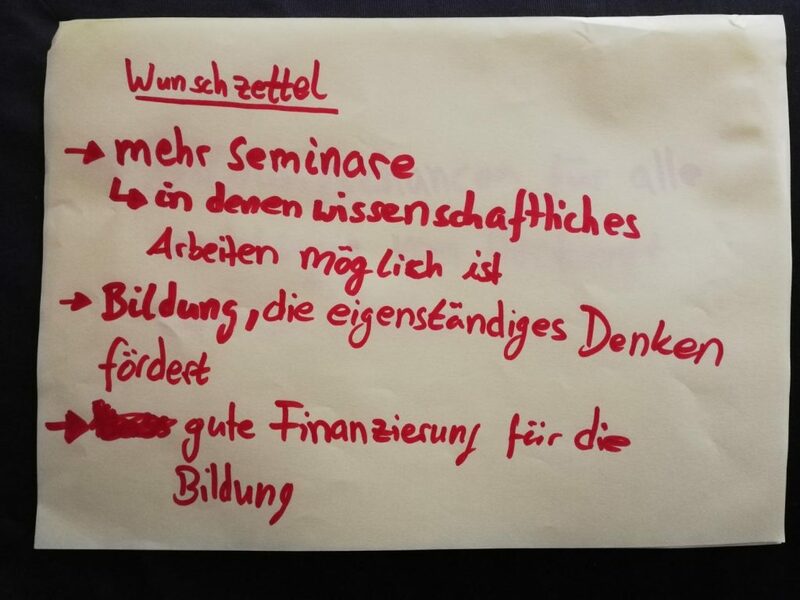 Gestern haben wir an unserem Glühweinstand eure Bildungswunschzettel eingesammelt. Hier seht ihr eine Auswahl von dem, was am Stand geschrieben wurde. Tody was St. Nicholas´day and we donate chairs at the uni. Since the university told the PNP (the local newspaper), courses would only be crowded, if there are enough chairs, we protested for satisfactory courses for all students. You were unfourtunate and didn´t get a giftbag? Here you can see, what was inside. 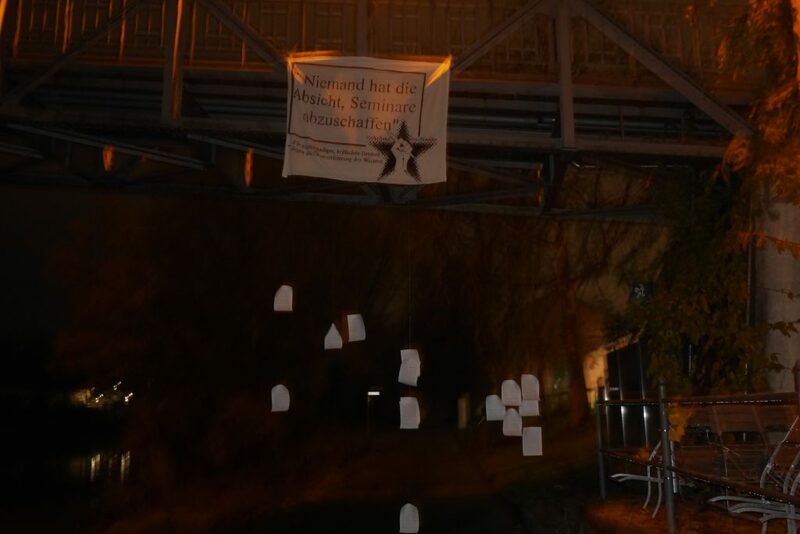 Gestern Abend haben wir gemeinsam mit über 70 Menschen gegen einen Vortrag der AfD in Tittling demonstriert. 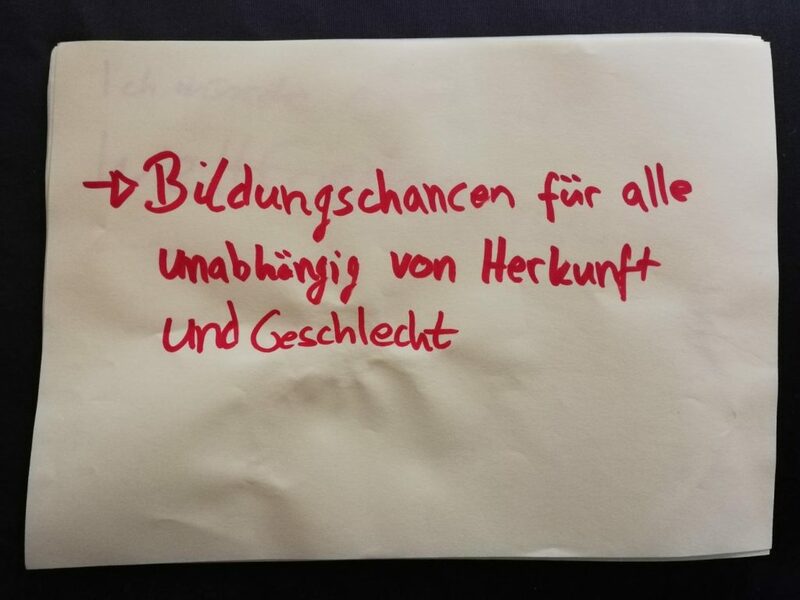 Die AfD hatte sich im Gasthof zur Post in Tittling einquartiert, nachdem ihnen die ursprünglich reservierten Räumlichkeiten im Hotel-Restaurant Burgwald gekündigt wurden. 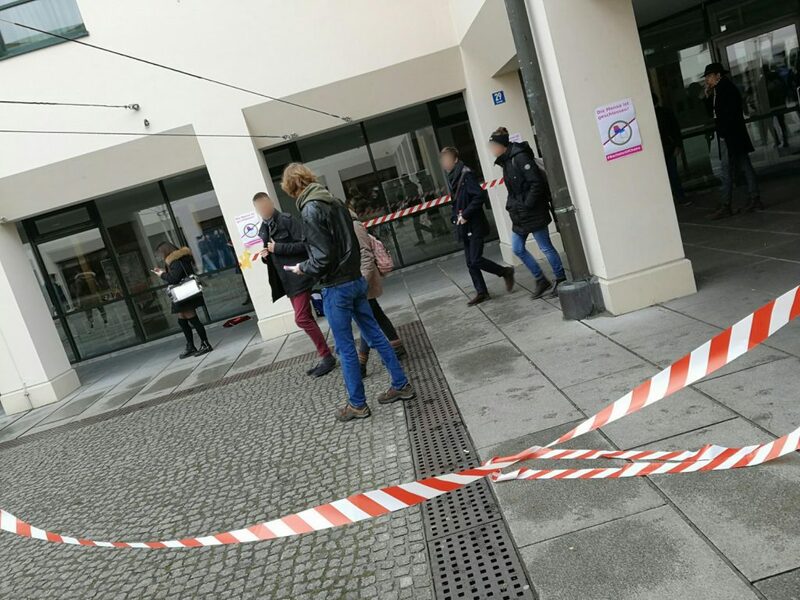 Zuvor hatte die AfD den Vortrag unter Privatnamen angemeldet, als jedoch bekannt wurde, dass es sich bei den Reservierenden um die AfD handelte, reagierte der Wirt couragiert und setzte die nationalistische Partei vor die Tür. 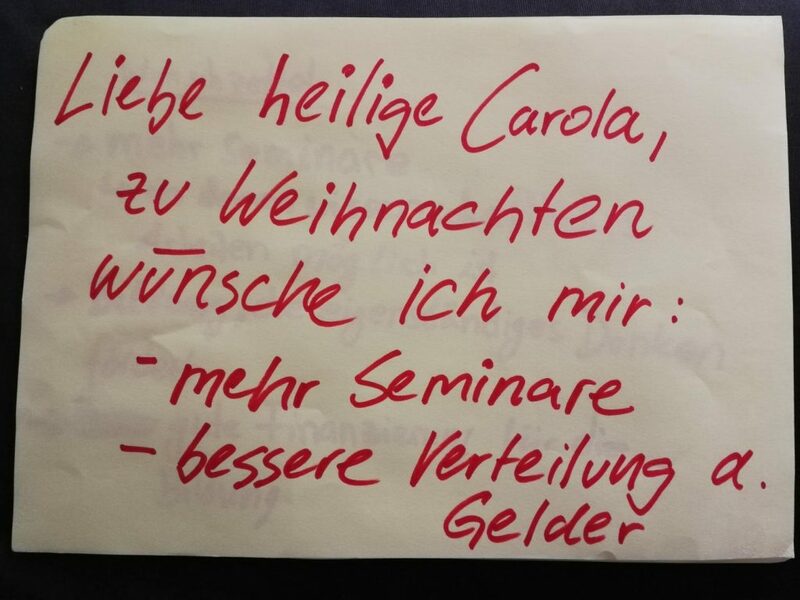 Der Vortrag hatte dann übrigens nicht stattgefunden – Der Referent hatte keine Lust. 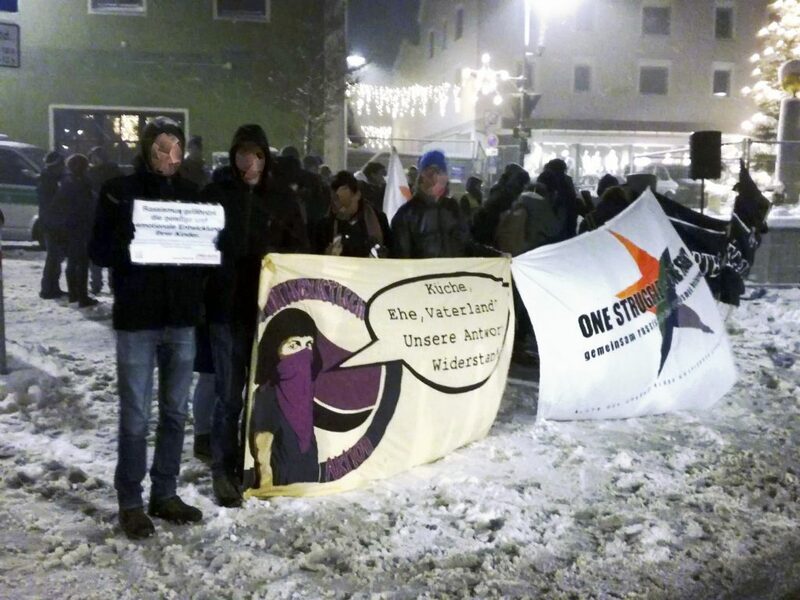 Wir danken den Jusos Passau und dem Runder Tisch gegen Rechts Passau für die gute Zusammenarbeit in der Vorbereitung dieser Demo. This noon, activists of LUKS, equipped with reflective vests and tools, went all over the campus distributing flyers. They anncounced to rebuild the university. Again, the reactions of many students made visible, how important the topic of the crowded university is. According to the university, a seminar is only crowded, if there aren´t any free seats. If it is that simple: Let´s enlarge all rooms! Sadly, as we all know, that no matter how many seat are in a room, it´s impossible to do proper scientific work, if there are more than 40 participants. But that´s a realisation that the university hasn´t come to yet. 1. to distibute the funds more properly. Funding of teaching, not of image-campaigns and exellence-strategies. 2. to organise the teaching more properly. At a number of new students as high as now, it is necessary to develop well-made plans, to ensure teaching for everyone. Hoping for selection through competition causes the opposite. 3. to strive for more money. Both federal states and the government in Berlin must fund education. This is only possible, if the universities campaign for the abolishment of the cooperation-ban. The reconstuction of the canteen into a room for seminars has begun! This noon Luks closed the canteen as a part of the campaign #BachelorOfChairs symbolicly with barrier tape. This action is nothing but consequent in the logic of the university, who which isn´t interested in a high-quality teaching, but only in economical effiency. Acording to their view, a seminar is only crowded, if there aren´t enough chairs in the room, no matter whether thre are already too many students in this seminar, if proper learning is wanted. 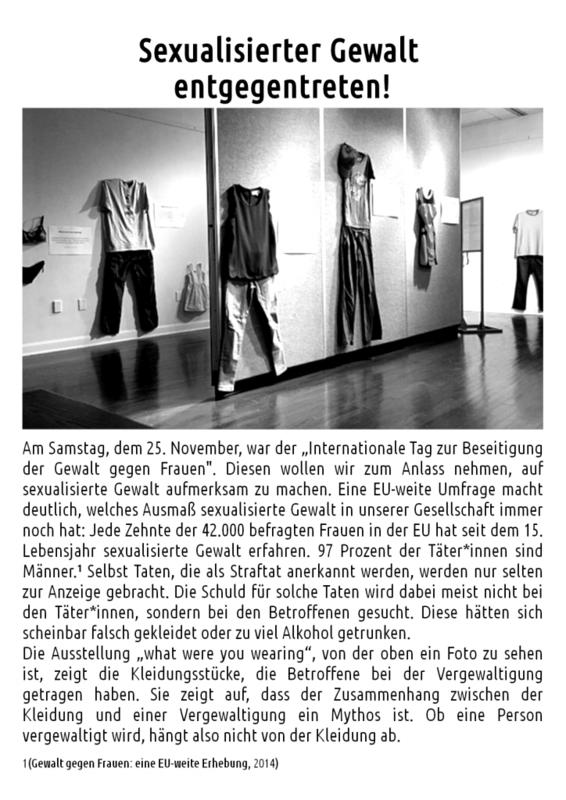 Zum “Internationalen Tag zur Beseitigung von Gewalt gegen Frauen*” haben wir eine Position zum Thema “Sexualisierte Gewalt” erarbeitet. 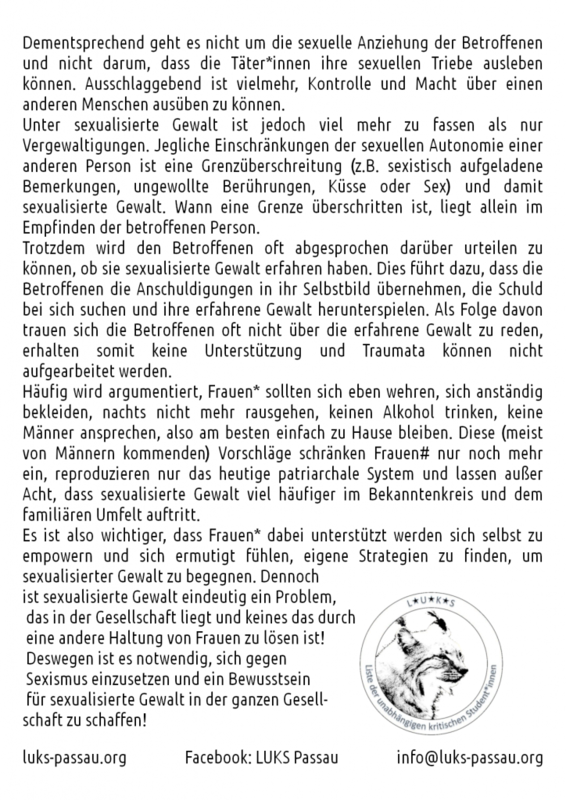 Diesen Flyer haben wir an Student*innen verteilt um auf die Thematik aufmerksam zu machen. – against the economisation of knowledge. 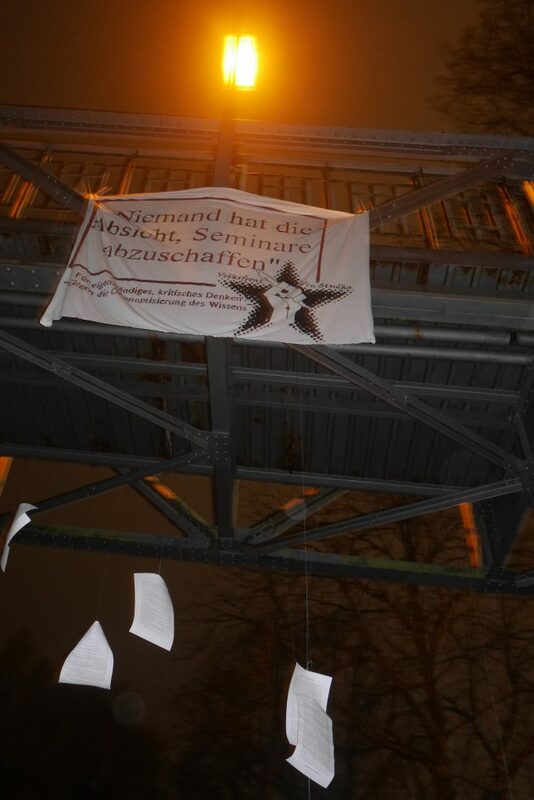 A banner with this slogan was hung on Passau’s bridge ‘Fünferlsteg’ last week in critique of the current developments and learning conditions at the University of Passau: precarious study conditions and housing shortages. Only recently, an impromptu lecture in sociology has been launched to supplement the overcrowded seminars at the university. However, hierarchical teaching formats like frontal lectures limit independent thinking even further. With the maximum duration of study, performance pressure through grades and more subject matters being repeated and left unquestioned in fewer time, students are facing more and more distress. Instead of fostering collaborative together, our educational system produces self-centered individuals without a chance of solidarity. Students are learning against rather than with each other. It is time to regain our consciousness of the people behind ‘human capital’; to rediscover our quest for knowledge. We demand the possibility of self-determined and critical learning – no further economisation of our education! While the conditions at our university are deteriorating, its surroundings are turning more and more precarious as well. Even four weeks after the semester has begun, a vast number of students have not yet found an apartement and are forced to commute from home or stay in hotels. Although this may be a minor issue in a small town in Lower Bavaria in comparison with larger cities, the problem is increasing. With Passau’s rents having risen by almost 30% in the past 5 years, many student find themselves unable to get affordable apartments. Instead of compensating students, efficiency is demanded. We can and will not accept these developments! 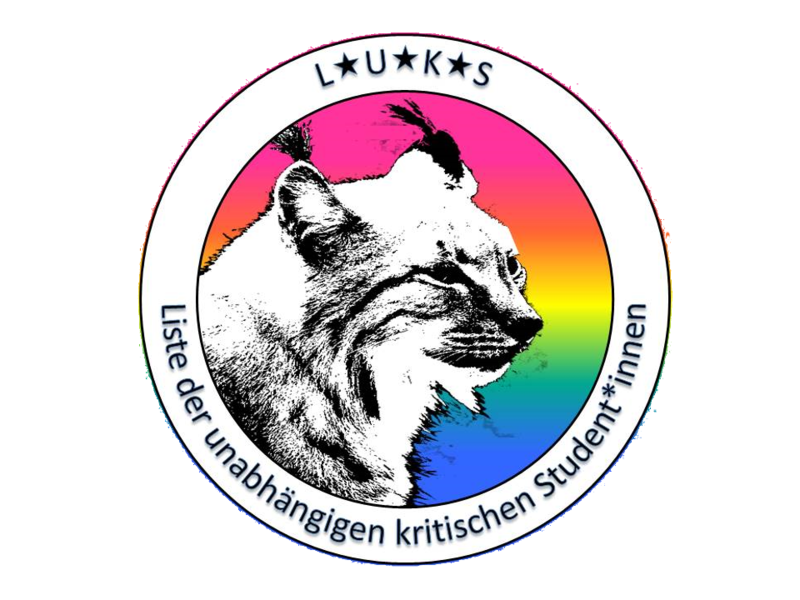 Das Studierendenparlament der Universität Passau hat am 11. 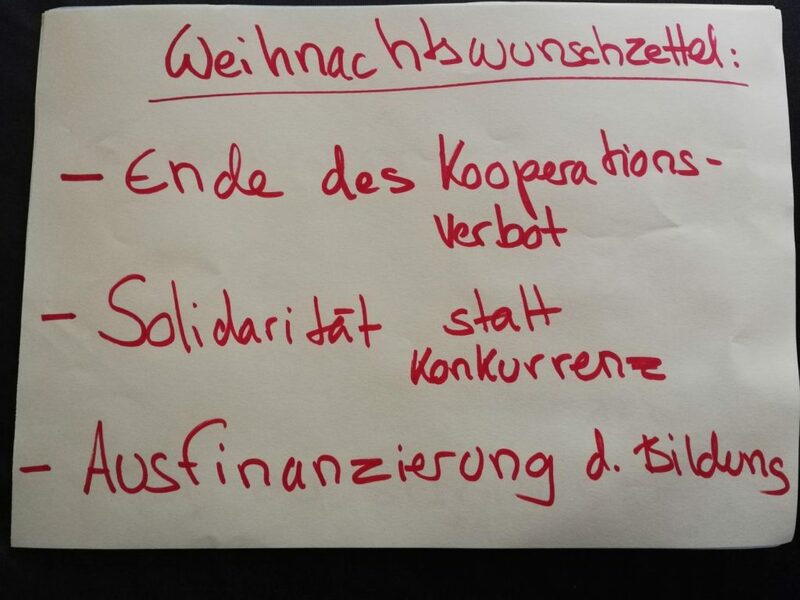 Mai mit den Stimmen aller Gruppen und großer Mehrheit einen Antrag von LUKS angenommen. 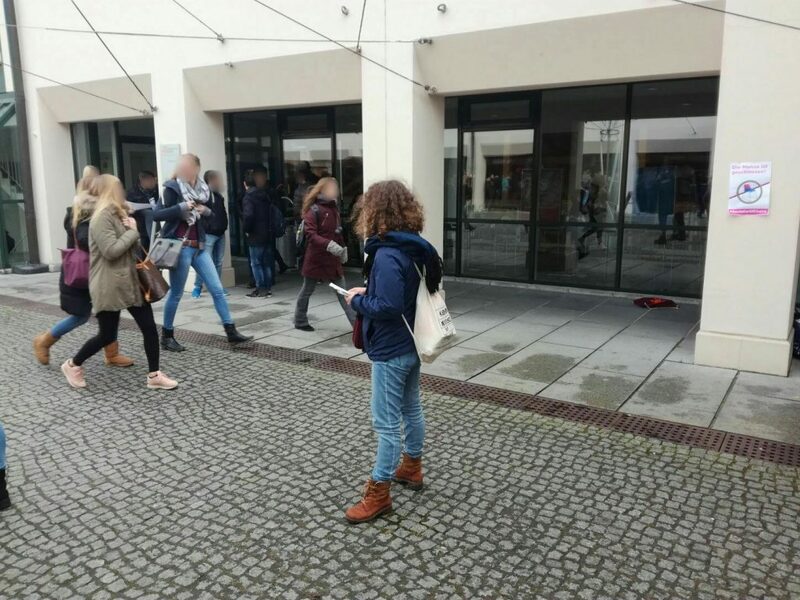 In diesem Antrag positioniert sich die Passauer Student*innenschaft für eine offene Gesellschaft und gegen Rassismus, Sexismus, Chauvinismus und Behindertenfeindlichkeit und insbesondere die AfD und ihre Hochschulgruppen.